Woodlake Great Backyard Bird Count – Woodlake: Life on the Lake! Do you want to count birds and be a citizen scientist? 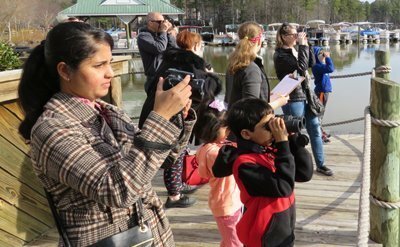 Swift Creek Nature Club (SCNC) cordially invites you, your family and friends to join us on Saturday, February 16, 2019 to collect data for a global citizen science project on bird conservation. Do you know that we have more than 160 species of bird species in our neighborhood? It is fun and easy! All you have to do is to count birds and report how many birds you saw of each species. You do not have to be a bird expert to be a part of GBBC. Members of the SCNC will guide small groups to find, identify and count birds around Tom Sawyer Bay area. You will get a chance to be a scientist and learn about local wildlife. Also you will receive an exclusive GBBC certificate for your participation, AND a chance to win prizes! 9am: Meet SCNC guides at the Woodlake Boat House (14710 Village Square Pl, Midlothian, VA 23112). Bring a pair of binoculars if you have and dress for the expected weather. 9am – 10am: Find, identify and count birds and take notes. 10:30am – 11:30am: Gather at Woodlake Club House (5020 Woodlake Village Pkwy, Midlothian, VA 23112), learn more about citizen science and enter data, have a snack and win prizes!! !